The official SHARP Certificate presentation took place on February 2, 2004. Pictured in front is Keystone president, Sam Stoltzfus. Behind him from left to right are PA State Representative Scott Boyd, PA State Senator Noah Wenger, Keystone Plant Manager Bob Lehman, Keystone Safety & Compliance Coordinator, Dave Landis, and US Congressman, Joe Pitts. More than six years ago, Keystone Plant Manager, Bob Lehman, began consulting with Indiana University of Pennsylvania (IUP) to achieve and maintain Keystone Wood Specialties’ compliance with OSHA safety standards. Two years later, as Bob’s time was filled to capacity with plant management, Dave Landis stepped in to serve as Safety Compliance Director. 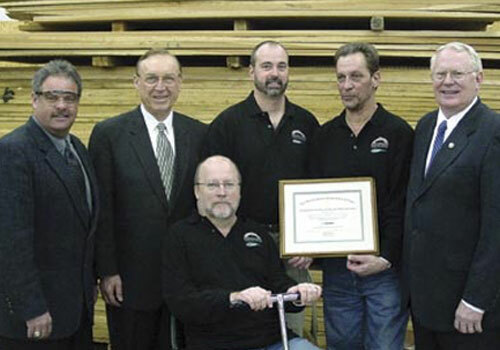 It was at that time that he made the first application for Keystone Wood Specialties to participate in SHARP, the Safety & Health Achievement Recognition Program. Open to firms with less than 250 employees, SHARP is a program of the US Department of Labor’s Occupational Safety and Health Administration whereby a company can be exempted from OSHA inspections for a two year period by exceeding their standards in safety management. “Meeting OSHA standards is one thing,” says Dave, “but SHARP was a personal goal for me. It proves we can exceed OSHA standards. The number of other companies in PA who have done this speaks for itself.” Dave is also quick to add that without the unhesitating support of management it could never have happened. In a separate conversation, Sam Stoltzfus points out that the work done to qualify for SHARP certification removesKeystone from having to react to safety incidents such as injuries and OSHA inspections. By having a proactive posture, everything runsmore smoothly and everyone benefits. “This speaks volumes about the employees we have and their level of commitment,” Sam says. “We could not have achieved this without employees who careI’m surrounded by employees who are concerned and care. The three basic thrusts of the SHARP program involve (1) the condition and status of the physical plant, (2) having a comprehensive, written safety policy and plan, and (3) a thorough program of employee training. So far this year, there has been no time loss due to injury on the job. That is almost unheard of for a company this size. Looking to the future, Dave says we are not going to stop. He has a vision for a functioning library of book and video training resources. Plus, he already has his sights set on Pennsylvania’s Governor’s Award for Safety Excellence. In spite of the fact that we were host to political dignitaries and officials from both OSHA and Indiana University of Pennsylvania (IUP), the focus remained appropriately on Keystone’s employees the morning of February 2, 2004. While our SHARP certification was completed last October, it was fitting that we recognize, in a formal way, the remarkable achievement it represents. So, after weeks of matching schedules and making phone calls we were able to make arrangements for the event on the first Monday in February. Fortunately, the wintery weather we had been experiencing cleared for the day. Speakers included U.S. Congressman Joe Pitts, State Senator Noah Wenger, State Representative Scott Boyd, and the consultants from OSHA and IUP who were involved with us in the SHARP program. Keystone president Sam Stoltzfus opened by welcoming the employees and our distinguished guests. He expressed his pride and appreciation for Keystone’s team work and commitment. Dave Landis, Keystone’s Safety/Compliance Coordinator, followed by recognizing the Safety Committee members. He then turned the podium over to Plant Manager Bob Lehman who recognized all the employees for their enthusiasm and cooperation. Keystone President Sam Stoltzfus welcomes our employees, dignitaries, and special guests. Keystone is one of only a few PA companies to receive the award. According to Dr. John Engler, Program Director for PA/OSHA Consultation, out of the more than 250,000 eligible Pennsylvania companies, approximately 1000 employers have applied for the SHARP certificate. To date, only 13 companies have qualified. After the award was presented our guests were treated to a plant tour followed by a luncheon for all guests and employees alike, compliments of the company.